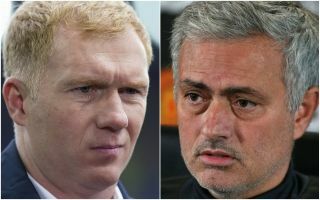 Manchester United legend Paul Scholes has aimed a pretty big dig at the direction his old club are heading in under manager Jose Mourinho. Speaking in the video below on BT Sport, the former United midfielder believes there doesn’t seem to be any improvement at the club at the moment. Others, meanwhile, look in great shape, says Scholes, as he mentions the likes of Manchester City, Liverpool and Chelsea after their fine starts to the season. “I don’t think any of us would expect them to win the Premier League or the Champions League,” he said on BT Sport. “It’s a work in progress as you say. I think it has been for three or four years now. United recently lost back-to-back games against Brighton and Tottenham but have since improved, though it’s easy to imagine many still feel the team is not really clicking as it should. "Do you see a team that's improving? I don't think so." ? Huge amounts has been spent on the players in this side, but big names like Paul Pogba and Alexis Sanchez are yet to really deliver. United were poor in the Champions League last season as they suffered a surprise early exit to Sevilla, so will hope to get this campaign off to a good start tonight with a win against Young Boys.